Career opportunities at zoological parks can be quite scarce as many animal career seekers are interested in working with exotic wildlife. Zoos usually receive dozens of applications for each position advertised. It is certainly possible to increase your odds of landing one of these coveted positions by enhancing your resume with hands-on experience and education. The first step to getting a job at the zoo is determining what career path you would like to pursue. Popular zoo career options include zookeeper, zoo educator, zoologist, wildlife veterinarian, and veterinary assistant, though there are also many roles available in management, administration, and support positions. By defining your area of interest early on, you can select your college courses and internships to strengthen your resume for that career path. Thoroughly research the career that you intend to pursue. You might be able to arrange an interview with a zoo staff member who holds the type of position you are interested in; meeting with someone who works in your field of choice can be invaluable. You can also research zoo careers through the Association of Zoos & Aquariums, in career guidebooks, or in animal industry publications. The level of education required for a particular position can vary from a two-year degree to a four-year degree, with some positions requiring additional study at the graduate level. Most students seeking zoo careers will major in fields such as biology, zoology, animal behavior, animal science, conservation science, or another related area. Keeper positions may only require an associate degree, though many keepers do have four-year bachelor of science degrees. Positions such as zoologist generally require a B.S. degree at minimum, with M.S. or Ph.D. degrees being preferable. Veterinarians must first complete their undergraduate degree before going on to veterinary school; those pursuing board certification in the veterinary field face additional years of training and testing. Volunteer internships are a great way to gain hands-on experience at a zoo. 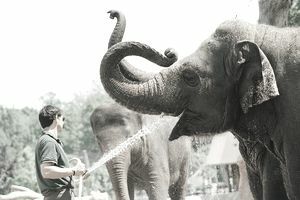 Many zoos have programs designed to allow members of the community to work with their animals in some capacity. Tasks may involve assisting with educational programs, helping to prepare daily rations for the animals, assisting with veterinary care, shadowing keepers as they care for animals throughout the day, or helping to maintain animal enclosures. Some zoos also have paid part-time or seasonal positions available. If there is not a zoo located close to you, it is also possible to gain experience by working, volunteering, or pursuing internships with animals at aquariums, museums, animal parks, humane societies, rescue groups, stables, wildlife rehabilitation facilities, or fish and game offices. Gaining experience as a veterinary assistant is a big plus for a variety of zoo career paths. Assisting a vet who deals with wildlife species is ideal, but working for an equine vet, large animal vet, or small animal vet also provides valuable experience that will enhance your resume. The key factor here is to gain experience by working with a variety of animals in a hands-on capacity. Zoo jobs may be advertised in trade publications like the Journal of Zoology, Zoo Biology, the Canadian Journal of Zoology, and other similar industry print offerings. Colleges and universities may get advance notice of impending vacancies, so it is wise to subscribe to any job-related email lists your educational institution may offer. Opportunities may also be found through a search of various industry websites such as the Association of Zoos & Aquariums (AZA) job listing, which provides job postings and career opportunities for zoos throughout the country. Individual zoo websites such as Zoo Atlanta, the Bronx Zoo, the San Diego Zoo, the Los Angeles Zoo & Botanical Gardens, and other such websites may also post position opportunities as they become available. It never hurts to visit the human resources department at the zoo office to fill out a job application and submit a resume. While you are in the office, check out the volunteer and internship opportunities, which are a great way to get your foot in the door. Your college may also be able to help with placement, so also check with your advisor and professors about any connections they might have.